What makes a beautiful space a home? For Twinkle Khanna and Akshay Kumar, it’s living amongst objects that tell stories. Contemporary art, family photographs and curios loaded with personal memories transform the clean lines of their duplex apartment in Mumbai into a private haven—a lush sanctuary amidst the urban chaos. The entire house, done by Twinkle Khanna right from drafting the architectural plans to picking the Paola Navone ceramic stools, is brimming with family photographs and mementos—artefacts collected on trips or gifts to each other. Art by her mother and son also feature throughout the home; Aarav has given the guest room door the Jackson Pollock treatment. Until recently, the family lived only on the ground floor. The second child ushered the need for more space, and the first floor was acquired. Now, the living and dining space, the kitchen, a home theatre and a room that functions as Akshay Kumar’s walk-in closet takes up the ground floor while the first floor houses the bedrooms, a pantry, Twinkle Khanna’s home office and a balcony with a daybed where the family plays Ludo and Backgammon. 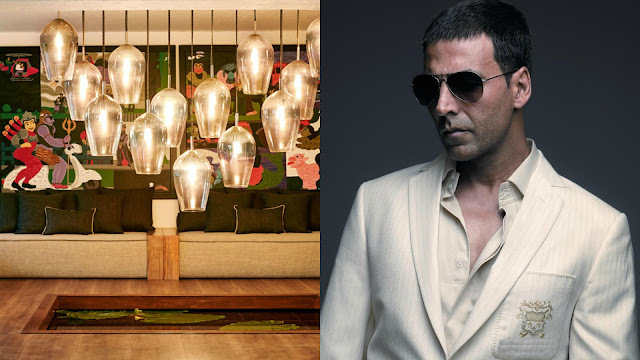 While the ground floor is spectacle oriented with a 13-part pendant light installation by Klove Studio, an indoor pond, antique silver candelabras and a brass-and-glass Abu Jani-Sandeep Khosla centre table, the first floor is considerably muted—closer to the aesthetic of Twinkle Khanna’s own design brand, The White Window. Here, grey dominates on Italian-style sofas and a floating Dedon daybed hangs invitingly beside her writing desk. The innovation she’s most proud of is a bookshelf under the staircase. “It’s a tricky space for everyone, usually wasted or reserved for shoes… but I needed a space for my crates of books,” she says. Harbouring a particular dislike for metallic railings (and chrome and plastic in general), she crafted a unique railing with rope. Having grown up in a Delhi flat with an extended family of 14 packed in two rooms, he cherishes the ideas of space and privacy. Their building has a generous strip of green in the front, then comes the beach and then the sea; there’s no traffic, no road cutting between the sea and the home like it does in other parts of the city. “I love the layers of green and blue when I look out,” he says. It is this depth to the landscape that drew him to the plot when he’d first visited it a decade ago. For Twinkle Khanna too, the best feature of the home is the glass-walled bathroom in the master bedroom. When the screens are up, the vantage from her shower allows her to look right through the one-way glass and out at the landscape. Twinkle Khanna’s best friend (and business partner) and Akshay Kumar’s mother and sister live in the same building; while Dimple Kapadia’s house and Akshay Kumar’s office and gym are right around the corner. Living enveloped by friends and family is important to the couple. “Often, when we want to go out for dinner, we just walk on the beach to the Marriott. Nobody bothers us,” says Akshay Kumar. That’s the silver-framed memory for this household—just a family, holding hands, walking on the beach.